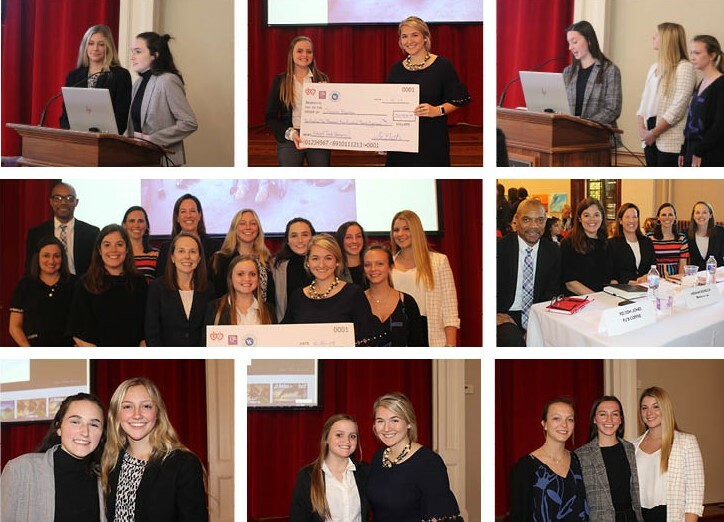 Upper School financial literacy students at the Academy of the Sacred Heart presented business plans for their own "dream coffee shop" during the third annual Sacred Heart "Shark Tank" on April 15. Through the financial literacy course, students learned about all aspects of running a small business and becoming financially literate—beneficial 21st-century skills, regardless of one's career. Students began their studies over the summer by taking an online financial literacy course powered by EVERFI and sponsored by IBERIABANK to gain background knowledge. During the school year, they heard from guest speakers and took part in hands-on projects, such as mock interviews and tracking their personal spending to create a personal budget for their future. Taught by PJ's Coffee franchise owner Aubry Miller, the course also gave students the opportunity to run the small franchise of PJ's that opened on Sacred Heart's campus in 2015. Each year, all money earned in tips is donated to an organization of the financial literacy class' choice as a way to give back to the community. This year, students chose to support Team Gleason. During the "Shark Tank," students presented the highlights of their business plans as if they were ten years in the future, touching on topics such as their background as business owners, the company mission statement and description, sales forecast, industry analysis, loans, and much more. Each business plan was evaluated by a panel of judges, which included PJ's Roastmaster Felton Jones, Markey Sarpy Aucoin '89 of Hancock Whitney Bank, Hartley Meric Crunk '03 of Hancock Whitney Bank, Meghan Donelon '04 of IBERIABANK, and Lindsey Wands of Whitney Bank. After thoughtful deliberation, the judges announced the winning business plan—"Orleans Beans," which was presented by seniors Lane Whitsell and Oliva Wood.